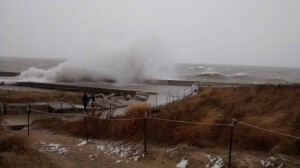 The high winds and resultant high waves drove many ducks off Lake Michigan and into Montrose Harbor today, February 24. Most were Common Mergansers and Common Goldeneye but I also had one White-winged Scoter. Two adult Iceland Gulls were also in the harbor. 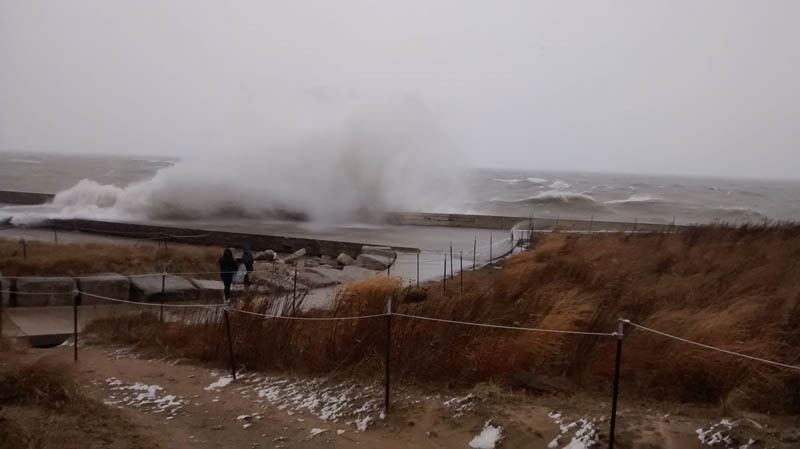 Here’s a shot of a wave breaking over the fishing pier. This entry was posted in Winter Bird Reports and tagged Gulls, Iceland Gull, Waterfowl, White-winged Scoter on February 24, 2016 by rhughes. 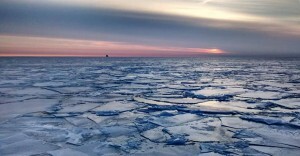 A nice, icy sunrise over Lake Michigan. The birding this winter has been unimpressive, but the sunrises haven’t. 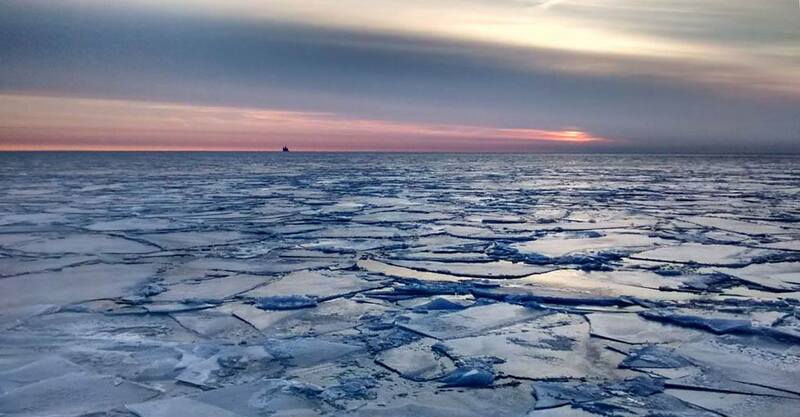 This entry was posted in Weather and tagged Ice, Lake Michigan, Sunrises on February 18, 2016 by rhughes. I walked around Montrose for a little bit this morning, February 16. It looked more like winter today than any other day I’ve been out there this winter, with ice on the lake all the way to the horizon, east, north, and south. The ice wasn’t continuous and there were scattered patches of open water here and there. In these patches were Common Goldeneye and Common Mergansers, the typical Lake Michigan winter ducks. Best were 4 White-winged Scoters that flew in and joined the other waterfowl offshore. I haven’t seen many White-winged Scoters this winter and this is the time of the year when they start to appear in numbers. 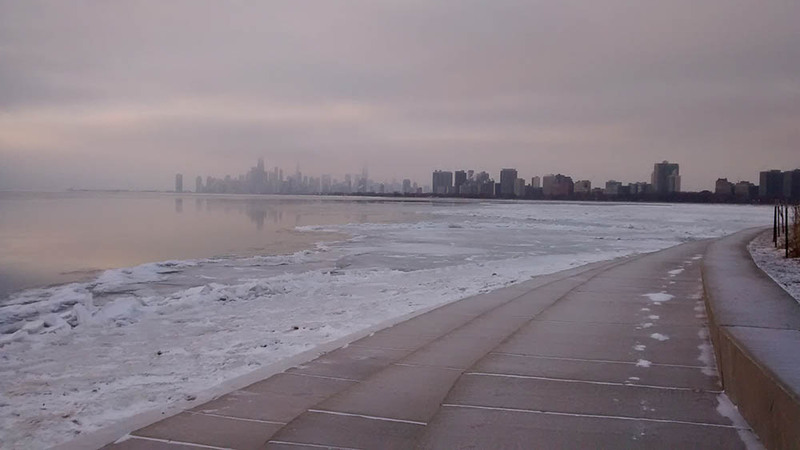 Perhaps the relatively mild winter and lack of extensive ice on the lake have something to do with this. I saw nothing else of note. This entry was posted in Winter Bird Reports and tagged Waterfowl, White-winged Scoter on February 16, 2016 by rhughes. I walked around Montrose for a bit this morning, February 8, and I can confirm that it still feels like winter. My most unexpected find was a Horned Grebe in the lake on the beach side of the fishing pier. I’m guessing this is an overwintering bird instead of an early migrant because of the date. I also saw the 2 continuing female type Ruddy Ducks in the lake south of the Magic Hedge. They’re been in the same area for over a week so they must like that spot. There were also several hundred gulls, mostly Ring-billeds, swarming over the open water at the west end of the harbor. I didn’t spend a lot of time looking through them so I could have missed something unusual. As I’ve mentioned in previous posts, some kind of small fish are running in the harbor, which is what’s attracting the gulls. This entry was posted in Winter Bird Reports and tagged Grebes, Horned Grebe, Ruddy Duck, Waterfowl on February 8, 2016 by rhughes.